National experts from Harvard, the University of Chicago, Clemson University, and the University of Houston gathered with LSU faculty and Baton Rouge leaders to explore the challenges of the modern city, future growth, and urban sustainability. It began on April 12 with a keynote lecture, “Understanding Cities through Measurement and Embedded Intelligence,” by Charles Catlett, senior computer scientist at the U.S. Department of Energy’s Argonne National Laboratory and a senior fellow at the University of Chicago’s Mansueto Institute for Urban Innovation and Harris School of Public Policy. Catlett’s research includes urban data integration and analytics; coupled urban models; and the design and use of sensing and “edge” computing technologies embedded in urban infrastructure. 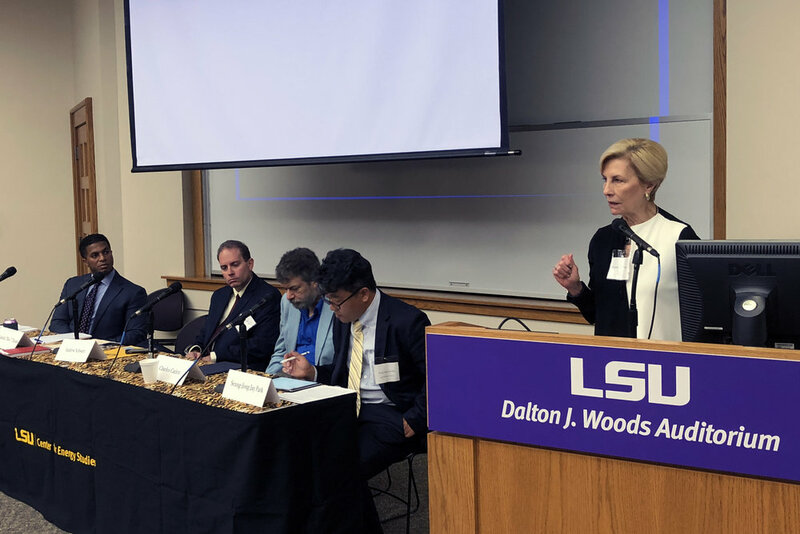 Following the lecture, there was a panel discussion on “Technology and Urban Design” featuring Catlett; Andrew Schwarz, E. J. Ourso College of Business, LSU; Elizabeth “Boo” Thomas, CPEX; and Christopher Tyson, LSU Paul M. Hebert Law Center. A second keynote lecture, “Tensions of Force: Policing, Security and Governance in New Orleans,” was delivered jointly by Aisha Beliso-De Jesús and Laurence Ralph. Beliso-De Jesús is a Professor of African American religions at Harvard Divinity School and a social anthropologist. Ralph is the John L. Loeb Associate Professor of the social sciences in the Departments of Anthropology and African and African American Studies at Harvard University. They were joined on a panel titled “Race and the Future of Urban Policing” by Revathi Hines, Southern University; and Raymond Jetson, MetroMorphosis/Urban Congress; and chaired by Lori Martin, LSU Departments of Sociology and African and African American Studies. On Friday, April 13, the conference featured two keynote lectures. Gary Machlis spoke about the “Future of Conservation in Urban America,” and poet Martha Serpas presented “Drain the Swamp? Ecological Metaphors and Paradox.” Machlis is University Professor of Environmental Sustainability at Clemson University. From 2008-2017, he served as the first scientist appointed as science advisor to the director of the National Park Service. Serpas is a Professor of English and Creative Writing at the University of Houston. A native of South Louisiana, she has been involved in efforts to restore Louisiana’s wetlands, and she co-produced the award-winning documentary “Veins in the Gulf,” which traces the history of the environmental crisis in southern Louisiana and its impact on Cajun culture. They were joined for a panel on “Urban Environments” by Brandon H. Ballengée, LSU Department of Biological Sciences, and John Day, LSU Department of Oceanography and Coastal Sciences (emeritus). The conference also hosted two poster sessions highlighting the interdisciplinary research of undergraduate researchers at LSU. In total, 16 projects were presented by students from the College of Art and Design; the College of Engineering; the College of Science; the College of the Coast and Environment; the College of Human Sciences & Education; the School of Renewable Natural Resource; and the College of Humanities and Social Sciences. Awards for best presentations were given to: Kaitlin Schuette (School of Architecture) for Densifying within the Divide: A Framework of Development for Kigali, Rwanda; Ben Smith (Department of History) for Sustainability and Urban Design in Krakow, Poland; Anjelica Sifuentes (School of Architecture) for Redefining the Borderland; and Brandon Champagne (Department of Environmental Sciences) for Resilience in Context: How Culture Shapes at-Risk Communities. This conference embodied the CCK’s aspirations to deepen and widen the university’s core mission as the place where ideas and expertise are shared across disciplines and among faculty and students. The Center hopes to build upon this event in creating future possibilities for collaboration.